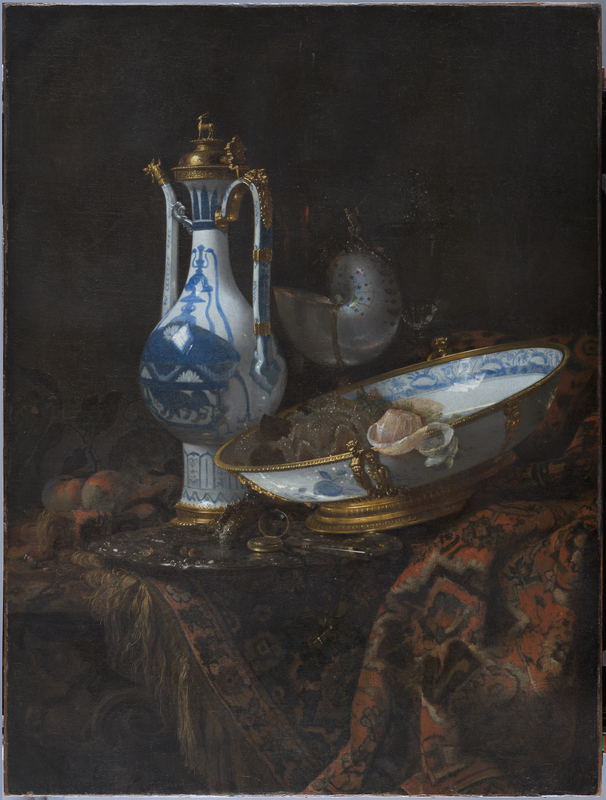 Like the other two still lifes by Kalf in the Collection, this is a mature work executed during his Amsterdam period. It falls within the type known as a Pronkstilleven. Using a vertical format the artist repeats a composition found in his earlier works. The exquisite, costly objects are located on a marble tabletop set against a dark background in which it is just possible to make out a niche. Here the table is supported by an elaborate leg carved in the form of a female bust. On this occasion, the table is covered by an oriental rug which is piled up on the right side and whose fringe falls in an irregular manner over the edge of the table. Towards the back we see two peaches, a melon and three vessels, comprising a nautilus shell and two glasses of red and white wine. The principal motif is a silver tray with an ornate border on which the artist has located small objects such as the pocket watch with a key and ribbon next to a knife with an agate handle. The two most striking objects with regard to their colour, value and size are the ewer and basin, inside which is a preserved orange and a half-peeled lemon with curling peel that falls over the basin’s rim. The ewer and basin are a collector’s item and this is the only known depiction of such a pair of objects within Kalf ’s oeuvre. Their decoration and shape also make them exceptional and both have been studied by porcelain scholars who have dated them to the second half of the 16th century. The two have European mounts, which, in the case of the ewer, have been dated by Lunsingh Scheurleer to between 1580 and 1590 and may have been made by a London craftsman. The Archaeological Museum in Teheran has a similar set formerly in the collection of Shah Abbas of Persia. A similar mount to that on the present ewer is to be found on a jug in the Victoria and Albert Museum, London, while the basin can be compared to a comparable piece also in the Museum in Teheran from the same collection. Sam Segal noted the fact that some items from Shah Abbas’ collection may have reached Europe, where they were mounted in England, from where they may have passed to the Dutch art market. Another unique item in this painting and one not seen elsewhere in Kalf ’s work, is the nautilus cup crowned with a figure of Neptune with his trident. 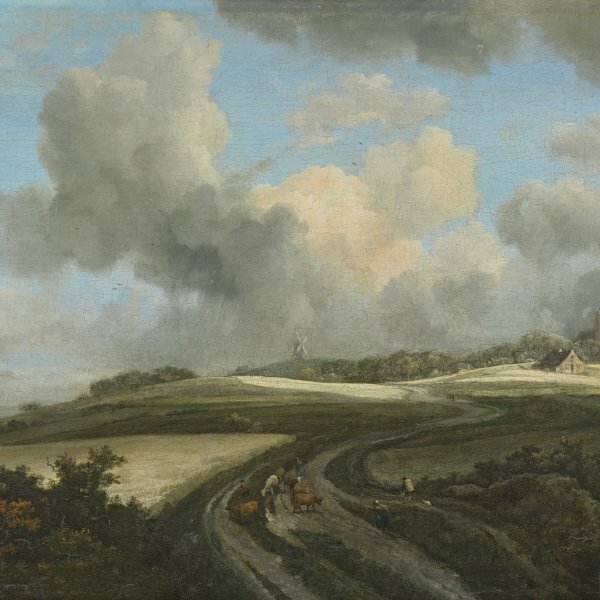 The attribution of the canvas to Kalf was questioned in the 1920s when it was suggested that it might be by Juriaen van Streeck. This idea was rejected due to the quality of the work in which it is possible to detect Kalf ’s distinctive technique in the interplay of light and shade that makes the objects emerge from the darkness of their surroundings. The canvas entered the Thyssen-Bornemisza collection in 1928 and was inherited by Baroness Gabrielle Bentinck on the death of Baron Hans Thyssen-Bornemisza. It was re-acquired for the Collection in 1981.